There has always been a lot of folks feeling strongly about digital magazines pricing. Generally, that the creators make one and sell many times without the cost of the paper and printing. The argument has been that it costs a lot more for all of the interaction in a digital magazine than a print version. That is only the case of interactive magazines like Wired. Many others are just PDF like versions of what you find on the local newstand, they generally are less expensive than the print version. It appears that this month, Wired would like to get people in to try out the features so they can better decide if they want to pay for a print version or an iPad version. The first issue has always been free but it didn’t have much multimedia in it. This month is an example of their latest technology. 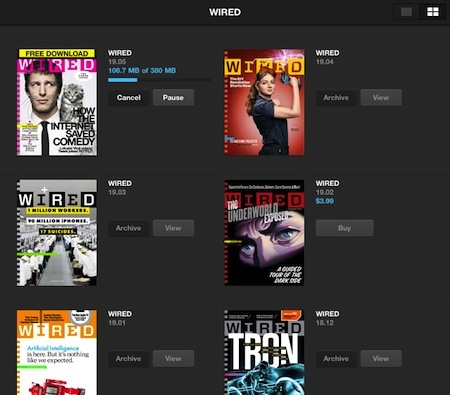 To install/read, just download the Wired app, when you launch it will show you the past issues you can buy, the latest release should have a Free option. These are ‘big’ magazine files so they wont download over the 3G connection.